On April 15, 1912, the biggest ship in the world named the RMS Titanic sank below the frigid waters of the North Atlantic. On her decks, and within her interiors, were over 1500 people that were about to die in one of the most horrible ways possible, trapped with nowhere to escape with no help coming when they needed it the most. For 73 years, Titanic lay peacefully on the bottom of the sea until an undersea explorer named Robert Ballard, and a team from Woods Hole Institute, used special equipment with sonar on it to locate the sunken ship. After Ballard’s discovery of the famous ship, there were subsequent dives to the wreck to recover artifacts from the mile-long debris field that was located between Titanic’s bow and the stern. However, other than just trinkets and luggage from the passengers that lay scattered all over the sand, did the underwater explorers recover more than just artifacts? 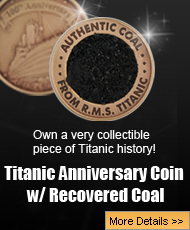 The company that was placed in charge of Titanic’s precious artifacts is called RMS Titanic Incorporated, and they too were in charge of the long process of preserving the artifacts that had been sitting in salt water for almost three quarters of a century. Salt water can be very damaging to certain materials, and it took years for some artifacts to be rid of it. 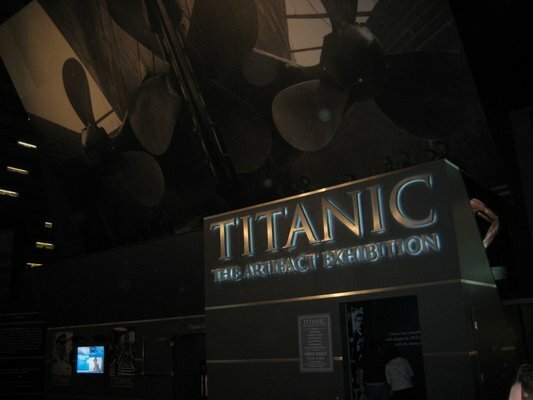 Once the artifacts were ready to be displayed, RMS Titanic Incorporated decided to share them with the world in exhibits at certain locations, and some of those locations ended up becoming permanent exhibits. Despite the fact that some people protested the displaying of Titanic artifacts, including Eva Hart, a survivor that was just seven years when her and her mother were placed in a lifeboat by her father, the artifacts were hugely successful as thousands of people turn up at every location to see remnants of the magnificent ship. RMS Titanic Incorporated began letting more artifacts out on tour, and soon there were multiple locations that had artifacts, including Las Vegas that had the biggest piece of Titanic ever, a 17 ton piece of the hull known as the Big Piece. One location that has Titanic artifacts was the Georgia Aquarium that is located in Atlanta, Georgia. The employees have reported hearing voices, seeing shadows, being touched, and the reports are so many that a team of paranormal investigators from the hit Syfy channel show, Ghost Hunters agreed to go to the location to do an investigation in 2009. During the course of the investigation, the team experienced what some of the employees had reported including pressure like they were being touched, and they did manage to record a voice, they took readings of cold spots that were in one room that had a cabin recreation, and saw a shadow walk across one of the doorways. One of the investigators claimed to have seen a full bodied apparition that he thought was one of his fellow investigators, but that was not the case. 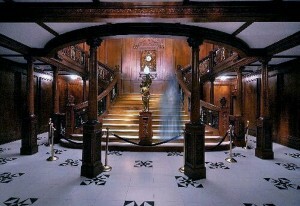 After reviewing the evidence, the paranormal team concluded that the Titanic exhibit was indeed haunted, and reported their findings to the George Aquarium staff. The Georgia Aquarium is not the only location that has reported paranormal activity, the Titanic Exhibit at the Luxor Hotel has also had paranormal activity that has had strange occurrences experienced by both visitors and employees. One person claimed to have taken a photograph of a woman in a black dress standing on the Grand Staircase recreation; he thought she was real, and even spoke to her, but then she vanished before his eyes. Some visitors have reported seeing the same woman walking down the staircase, which is not allowed, and the staircase is actually roped off to prevent people from climbing up and down the stairs. In addition to seeing a woman in period clothing on the stairs, employees have also heard the sound of children, and also the sound of an orchestra playing. Can Artifacts Retain the Spirit Of The Owners? Atlanta and Las Vegas are not the only two Titanic Exhibits that have reported strange incidents. 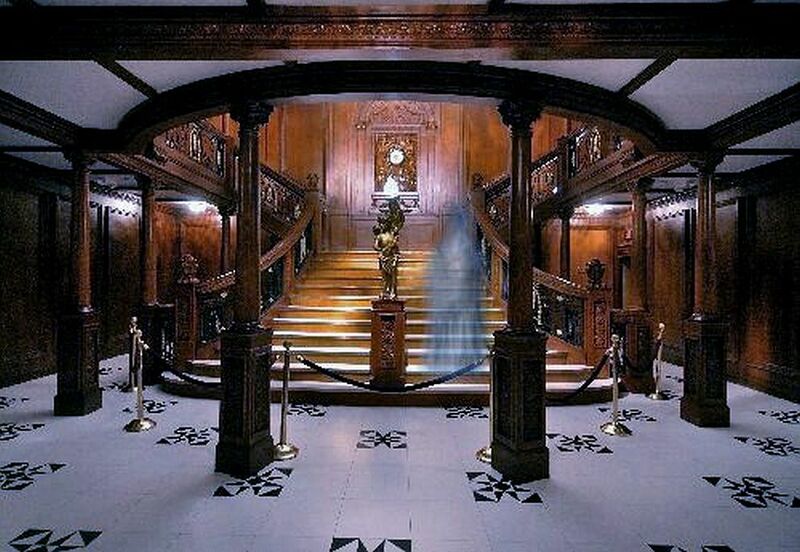 It seems that everywhere the Titanic artifacts go, strange things seem to follow them. Is it possible that the Titanic victims are trying to communicate with the living or are they just attached to their personal possessions that are now on display for all the world to see? When people go to any Titanic Exhibit to see artifacts brought up from the bottom of the ocean, and with people reporting seeing and hearing things in the different rooms where the artifacts are displayed, may get more than they bargained for when they buy an exhibit ticket. Previous post: Titanic 2 – Myth or Reality?